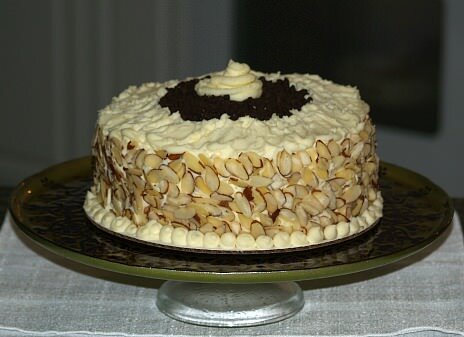 I learned how to make Italian cake recipes because I love cakes from all over the world. They have always been my first choice for dessert. Even today, I take times when I just have to have a good piece of cake. I am not talking about one bought from the bakery or even one from a box; I am talking about a good homemade recipe. Let us get back to the Italian kitchen and a little history of the Italian recipes and the making of them. At the end of the sixteenth century, new unknown fruits and many new spices began to flow into Italy from the New World. Added to these products, like sugar, coffee and chocolate helped to enrich and add flavor to the old recipes. Brought in also, about the same time were new techniques of mixing and baking these recipes. When I learned how to make Italian cake recipes, I found that no part of the cuisine was affected so greatly as desserts. With the addition of new techniques as well as new ingredients, especially sugar, the delicious creamy Italian desserts were allowed to emerge. One technique that I always think about is whipping the egg whites to get a lighter and airier texture in the cakes; so important in many of the recipes. I still find many around the world do not practice this technique. When I was learning how to make Italian cake recipes, I found many which utilize prebaked sponge cake or lady fingers. These can be homemade or purchased to make them easier. The national unification of Italy continued to move on and truly influenced the Italian cooking, especially the Italian cake recipes. Traditions and usage of a local and regional nature began to spread beyond the small confines and integrate one with the other. Italy never had an early culinary school to set guidelines of their cuisine so it kind of emerged as products came available and people’s taste demanded. The nineteenth century was a time of decisive importance in the history of Italian food. I realized this in my research of many of the dessert recipes. Many I have considered to be old traditional recipes but I find that they were developed only in recent years. Today the Italian cake recipes are used for many special celebrations like here and in other parts of the world. Great wedding cakes, dark fruit and nut cakes, almond and many others are a festive food. The techniques used in making them constitute one of the happier culinary arts. The Italian cake recipes baked today are the end products of years of refinement, both through the ingredients and the way those ingredients are manipulated. For centuries the Middle East was known for their cakes and desserts because of their ingredients. Arabs had spices and perfumes of the Orient to make special desserts. The Persians made cakes flavored with cinnamon, cloves, nutmeg, almonds and walnuts. Because the most important Western ports were in Italy. Italians had the closest contact with Arab traders. They were the first to use their information on food, like the Italian cake recipes which were developed. From Italy the culinary arts spread into France and other countries. Many French cooks used to acknowledge their Italian origin in the titles of their recipes that developed from wonderful Italian cake recipes. Grease, line with parchment paper, grease again and flour lightly 3 nine inch cake pans. Sift together the sifted flour, salt and baking powder three times; set aside. Beat butter and sugar; add eggs beating after each. Beat mixture until light and fluffy; beat in vanilla. Add flour mixture and milk alternately while beating. Scrape bowl and beat until well blended; divide evenly into prepared pans. Cool 10 minutes and remove cakes from pans; remove parchment paper and cool completely. Lay several layers of paper towels on a tray and place ricotta cheese on top. Use several more layers of paper towels and press down on the cheese to remove excess moisture. Combine ricotta cheese, powdered sugar, cinnamon and extracts in a large bowl; stir in chocolate chips. Set aside and mix frosting. Combine and beat together mascarpone cheese, powdered sugar, milk and extracts ONLY TO BLEND. Place one layer of cake on cake plate; top with 1/3 or more of ricotta filling. Place another cake layer on top of the filling; spread about another 1/3 of filling on top. Place third cake layer on top; I placed remaining filling on top in the middle. NOTE: You can frost as you like but I will tell you how I made mine. Frost the sides and top layer around the edges with frosting. Press almond slices all over the sides to cover. I used a piping bag to frost around bottom and to touch up the top. Cover center with mini chocolate chips. Refrigerate cake for several hours or overnight before cutting; store in refrigerator. 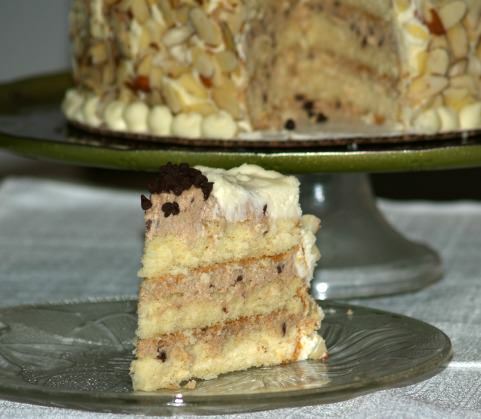 Of all the Italian cake recipes, this one is the most popular here in the United States. I really do not know “how Italian it is” but I can tell you it is so delicious. Preheat oven to 325F degrees; grease and flour 2 layer pans or tube pan. Cream together butter, shortening, sugar and vanilla. Sift flour, soda and salt. Beat egg yolks and buttermilk; add alternately with flour mixture to creamed mixture. Stir in coconut and chopped pecans. Fold in beaten egg whites; spoon batter evenly into prepared layer pans or tube pan. Bake 30 to 40 minutes for layers or 1 hour for tube; check with pick. Frost cooled cake with cream cheese frosting. Combine and beat ingredients until light and fluffy; cover cake. This Italian cake recipe is popular in central Italy in the summertime. Preheat oven to 350F degrees; grease 8 inch spring form pan with butter and dust with amoretti crumbs. Quarter unpeeled pears, core and cut into slices 1/8 inch thick. Put slices in ceramic bowl, add rum and toss gently to blend; set aside. Beat eggs and sugar on high until light and fluffy. Sift together flour, baking powder and salt; fold flour mixture into egg mixture by hand. Place half of pear slices on bottom of prepared pan, cover with batter and arrange remaining slices on top. Bake 20 minutes, quickly sprinkle top with powdered sugar and bake another 20 minutes or until pick comes out clean. If you love Italian cake recipes and the cannoli, you will love this cannoli cake roll. It has a ricotta cream cheese filling which is used a lot in Italian cake recipes. The frosting is flavored with orange liqueur. How delicious! Grease 15 ½ X 101/2 inch jelly roll pan; line with wax paper, then grease and flour. In large bowl beat egg whites, cream of tartar and salt on high speed to soft peaks. Gradually sprinkle in ¼ cup granulated sugar and continue beating until stiff peaks form. In another large bowl beat on high speed egg yolks, vanilla and ¼ cup sugar until thick. Gently fold beaten egg whites into beaten yolk mixture. Sift and fold flour into egg mixture 1/3 at a time. Spread batter evenly into prepared pan; bake 10 minutes or until cake springs back when touched. In a cup mix orange liqueur, 1 tablespoon water and remaining 1 tablespoon sugar; set to dissolve. Sprinkle clean cloth towel with powdered sugar; when cake is done immediately invert cake on towel. Carefully peeled off wax paper; brush cake with orange liqueur mixture. Starting with long side of cake roll up in towel jelly roll style; cool on rack seam side down until cold. Prepare filling: Combine and beat all ingredients except chocolate until creamy and smooth. Stir in chocolate; cover and refrigerate while cake cools. Assemble cake: Gently unroll cooled cake; spread filling over cake almost to edges. Reroll cake starting at the same long side, roll cake without towel. Place rolled cake seam side down on platter. Prepare frosting: Beat whipping cream and powdered sugar until soft peaks form. Fold in with spatula orange liqueur and vanilla; spread over the cake. Sprinkle top of cake with chopped pistachios and chocolate before serving. This Italian cake recipes is topped with a butter rum frosting. Grease bottoms only of two 9 inch layer cake pans; line bottoms with foil and grease foil. Beat eggs on high until they are thick and lemon colored; add sugar one tablespoon at a time. Beat mixture for 10 minutes or until volume has tripled. Gradually fold in the self rising flour; slowly pour in the melted butter and fold into batter. Fold in vanilla; pour batter evenly in the prepared pans and spread out. Bake cakes for 25 to 30 minutes or until it springs back when touched. Cool cakes in pans for 10 minutes; with sharp knife loosen cakes from sides of pans. Remove cakes from pans and remove foil from cakes; let cakes cool. Sprinkle each layer with rum. Make Frosting: Cream butter until soft and fluffy; gradually beat in some of the sugar. Beat in the egg, vanilla and rum; beat in remaining sugar gradually until good spreading consistency. When cake is completely cooled spread frosting between layers and on top and sides. Refrigerate to make cutting easier and neat. The history of Italian cake recipes tells that this is the traditional Sicilian cassata recipe. It is made with ricotta cheese rather than ice cream like some of the new commercial ones are made. Combine sugar and water in saucepan; place over moderate heat until sugar is dissolved. Put ricotta through a sieve and mix with sugar syrup; stir in chocolate, candied fruit and pistachio. Cut sponge cake into slices 3/8 inch thick then cut into strips. Moisten cake with wine and line 7 inch mold with 2/3 of the cake strips. Fill center with ricotta mixture and top with layer of sponge cake. Refrigerate several hours; unmold onto cake platter and serve with whipped cream. There are many traditional spicy Italian cake recipes containing honey, nuts and fruit like this delicious cake. Spread nuts on baking sheet and toast in oven until golden brown. Remove nuts from oven and chop coarsely. Reduce oven temperature to 375F degrees. Add chopped mixed fruit peel, spices and flour to nuts; blend well. Reserve 1 tablespoon of powdered sugar. Put remaining sugar in heavy saucepan adding the water and honey. Stir over low heat until bubbles appear on surface; immediately remove pan from heat. I am not sure where this came from but it reminds me of the Italian cake recipes; it is like a cheesecake without the cheese. The raspberry sauce makes it real special. Combine sugar, butter and almond paste; blend well. Add eggs, almond extract and liqueur; beat well. Combine flour and baking powder; blend in creamed mixture JUST until mixed- do not overbeat. Pour batter into buttered and floured 8 inches round pan. Bake for 40 to 50 minutes or until tester comes out clean. Invert on cake plate, dust with powdered sugar and cool; serve with raspberry sauce. 1 Pint fresh raspberries or 12 ounce package frozen. Combine ingredients in blender container and puree. Press through sieve to remove seeds. Serve over slices of cake.